It is the mark of an artist to see beauty in the tiniest detail and turn that into an inspiring work of art. An artist creates, always. Artists often have more than one medium to express their creative energy and that expression may not always take the form of tangible pieces of art to hang on the wall. Creative expression can also come in the form of a finely crafted meal, or in a lifetime devoted to generous friendships, as David C. Jansheski's life proved. 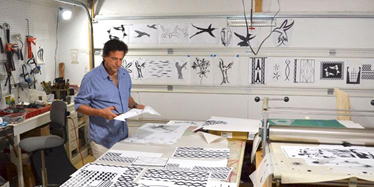 Contemporary artist and master printmaker David C. Jansheski's career spanned three decades and his portfolio of work reached an international audience. Before he passed in 2014 from cancer, he bequeathed his entire estate including extensive art collection, studio, and home to create the David C. Jansheski Fund for the Arts Fund, at the Community Foundation of Lorain County. Some 800 pieces were found in his collection after he passed. His gift ensured his legacy of supporting the arts in Lorain County forever. Though he was trained at the Minneapolis College of Art and Design and the Cleveland Institute of Art, David's considerable talent was largely self-evolved. He sought to constantly expand his reach, looking for that perfect image or texture that would feature centrally in his next piece. An avid photographer and world traveler, David took lots of photos for reference and inspiration. Lifelong friends Thom and Anne Palmer, managing the trust for his estate, estimate his photo collection to be equally as vast as his artwork. David used the power of his art as his way to contribute to causes he cared about. Among many charitable interests, he supported the ArtCares Benefit for the AIDS Taskforce of Greater Cleveland and Upper Keys Rotary to raise funds for disaster victims of the 2011 earthquake in Haiti. Teaching and promoting art education and arts in the community were important contributions from David during his lifetime. He loved working with children and tapping into their creativity. He did many workshops teaching children to harness their natural talents for exploration; if he could reach them and empower them to express who they are through art that was a true measure of success for him. Art supplies from his studio were donated to Firelands High School following his death to bolster the art program there. Known affectionately by his friends as "Chefski," David's talent for cooking rivaled his artistic skill and was yet another medium for his indomitable creative energy. David's meals were legendary among his friends and family as was his generosity with sharing his friendship both internationally and around the dinner table. At the point where it was clear to David that he would lose his battle with cancer, he worked avidly with the Community Foundation to establish a Fund that spoke to the legacy he wanted to leave behind. It was most critical to him to support arts and arts education after his passing and long into the future. His greatest gift that he could give to his endowment and the community was his art, a product of the passion by which he lived his life. David signed the papers establishing the David C. Jansheski Fund for the Arts the day before he passed away October 3, 2014. The Fund carries on David's legacy through the support of programming for fine arts in Lorain County. The Trust managing his estate continues to sell his pieces to grow the Fund and further its mission. A collection of David's work is currently on display at Ohio Wesleyan University's Ross Art Museum. A special memorial reception will be held on March 19 from 2-4 p.m.